Pollack - a tale of two Marks. My pals Mark Taylor and Mark Wills occasionally come down for a spot of sea fishing. They live a fair distance from the coast so it's quite a treat for them to get to the saltwater. 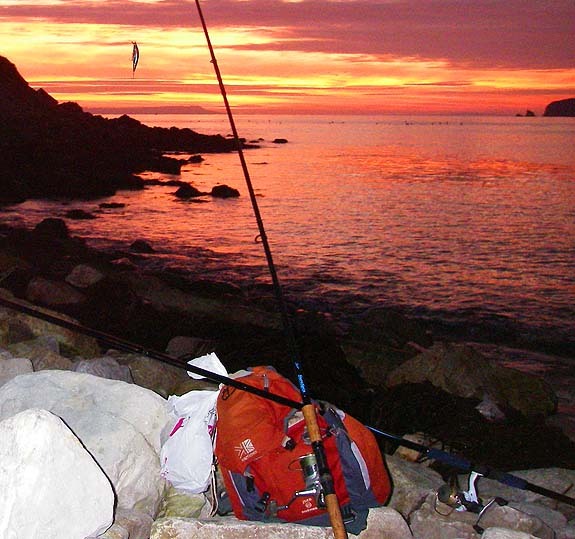 Anyway, they told me that they had every bait under the sun and that they were going to try an evening at Worbarrow bay, stay the night and try a morning session somewhere else. They like to make the most of their limited fishing time so I said that I'd try to meet them in the evening. I arrived just as the light was failing and could see that the only people on the beach (presumably my friends) were at the far end of the bay - quite a hike. I decided to try at the near end and began spinning with an 11 cm plug. I saw a couple of small pollack and a garfish jump so I was encouraged. By now the sun was going down in a blaze of red and orange light so I took a few pictures as a reminder. 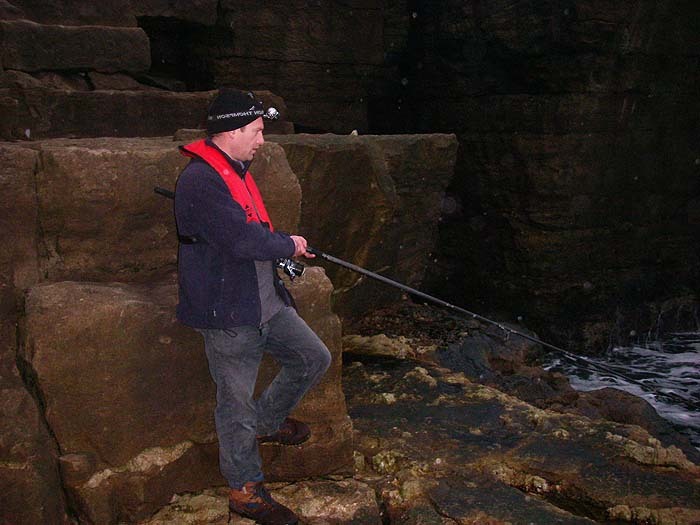 When I picked up the rod again the first cast produced a pollack which I returned. Then I switched to freelining two mackerel fillets (on the same hook) but apart from a couple of tiny taps (probably blennies?) - nothing! Before packing in (after not much more than half-an-hour's fishing) I thought that I'd better walk along and see how my pals were doing and also to find out their intentions for next morning. It was a long trudge and, to my relief, it turned out to be the two Marks when I arrived. They had five rods out on rests baited with everything from mackerel and squid to peeler crab - but (to my surprise) not a sniff! 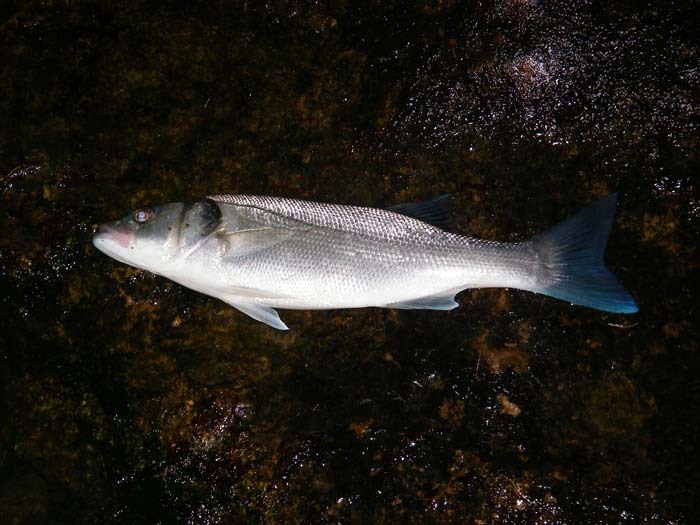 All they had caught (like me) was a couple of pollack spinning at last light. We had a good chat and arranged to meet at dawn the following morning. This time we were armed with spinning rods and (potential) live bait rods (if we could catch any baits that is). 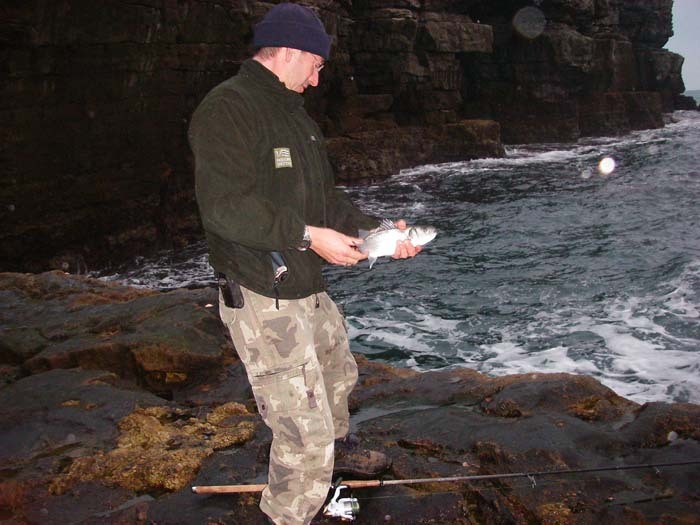 Spinning produced several small pollack on a range of lures and we hooked and lost two mackerel - so no baits. 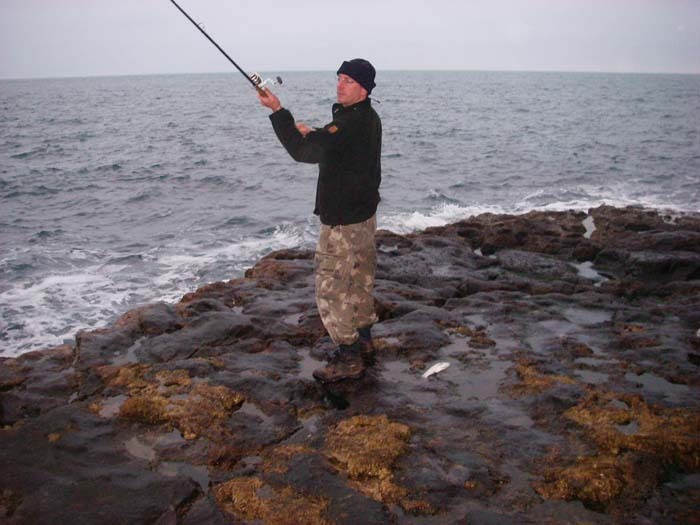 However Mark Wills did manage to catch a bass on his mackerel gear so it wasn't a total failure. Perhaps next time they visit (in 2007?) it will be a different story.